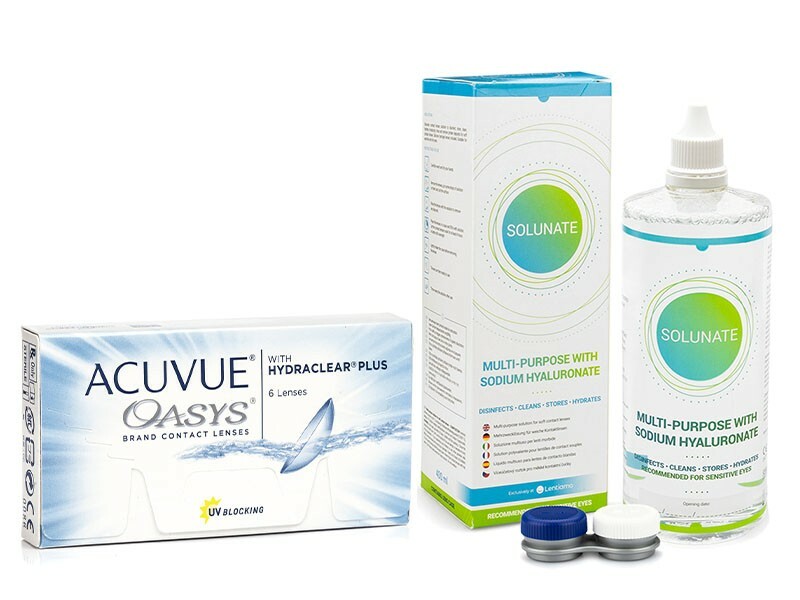 We offer an economy pack for fortnightly contact lenses Acuvue Oasys (6 lenses) with Solunate Multi-Purpose 400 ml solution. Solunate is a multi-purpose solution by an Italian manufacturer that offers not only high quality but also an economic pack for a good price. The 400 ml volume will allow you to use the solution five days longer than standard-sized solutions (360 ml) for an unbeatable price. The optimum ratio of quality and price makes the Solunate solution a very popular choice in the market. Solunate is the best-selling solution in our e-shop and a good alternative to the best solutions on the market, such as ReNu MPS Sensitive Eyes, Biotrue Multi-Purpose or OPTI-FREE. The versatile Solunate solution with hyaluronic acid is designed for disinfecting, rinsing and storing soft contact lenses, including silicone-hydrogel ones. The solution removes protein deposits and is suitable for sensitive and dry eyes. The optimal composition of the Solunate solution is perfectly balanced – it guarantees necessary efficiency and minimizes eye irritation. Thanks to the hyaluronic acid content, the solution provides long-lasting hydration and prevents dry eye syndrome. Hyaluronic acid has the amazing quality of water absorption and works as a highly efficient lubricant. It creates a protective film on the eye which reduces friction between the eyelid and the cornea which is beneficial for irritated and dry eyes. The contact lenses stay hydrated throughout the day and are more convenient and comfortable to wear. The Solunate solution comes with a case which is placed directly on the bottle and thus becomes a part of it. Thanks to that, the case is always at hand and you won’t lose it.